Although the Iranian regime oppresses all those who challenge their rule, one organization has been the target of decades of efforts to suppress and undermine their voice in support of a free Iran. They are the People’s Mujahedin Organization of Iran (PMOI/MEK). When Ali Larijni, the Iranian regime House Speaker, said after the MEK was removed from the U.S. list of terrorist groups, “Now it’s you (the United States) who are sponsor of terrorism and even mother of terrorism, yet you accuse the Iranian regime of sponsoring terrorism. Your accusations are shameful…Today, the Americans removed the MEK from their list of terrorist groups.” His remarks came during a speech on June 23. The regime controls the press in Iran, but with satellite television, the opposition is able to shed light on the regime’s activities and inform the Iranian people of such things as exposing of bankrupt institutions belonging to state entities, like the IRGC. “Some satellite channels linked to MEK have released a clip showing that Samen institution has gone bankrupt, scaring investors into rushing to Samen Bank branches,” said a regime official. After Khamenei’s speech, a rush of state-run media outlets attacked and made false accusations against the MEK. Things escalated following Khamenei’s fire-at-will order. Supporters of the Iranian regime called MEK the killers, and claimed that the order from Khomeini was meant to protect the country by killing anyone, including MEK members and supporters, who still stood their ground and supported the MEK. The attacks aren't limited to the MEK. The Friday Prayer Imam Alamolhoda in Mashhad attacked Rouhani for the increased popularity of the MEK and the movement seeking justice for victims of the 1988 massacre. “Today, we are faced with such a problem. To gain power and push away their rivals, they defend (MEK) so much that the supreme leader is forced to shout not to mistake executioner for martyr. Those claiming to run the regime are actually defending the MEK.” he said. The release of the Hassanali Montazeri audio tape detailing the roles of the death commissions in the 1988 massacre has sent shockwaves through Iran. Another gathering is being held in Paris on July 1st. There, the opposition will lay out their case for a Free Iran, one that doesn’t include the fundamentalism and repression of the regime. Speakers from various leadership bodies in the international community will show their support for the National Council of Resistance of Iran (NCRI), a coalition of opposition movements determined to create a peaceful regime change. The increasing popularity of the MEK is a dangerous development, according to the regime. And now, the NCRI and their supporters have called on the international community to support the people of Iran in their demand for the prosecution of the Iranian regime’s leaders. Human rights advocates and international bodies have continued to report on Iran’s record of repression. The United Nations and the UN Security Council have been called upon to adopt political and legal arrangements for the international prosecution of leaders of this regime on the charge of committing crimes against humanity. 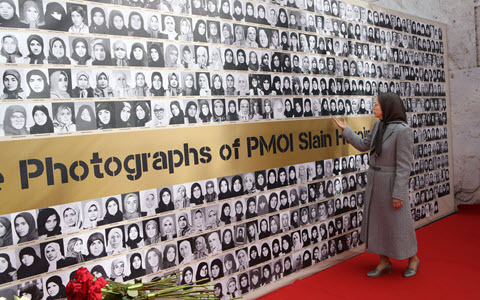 A necessary step toward ending mass executions within Iran, such as the recent execution of 25 Sunni prisoners, would be a formal international condemnation of the 1988 massacre, and would help the movement to obtain justice by the supporters of the Iranian Resistance, holding Khamenei and other regime leaders accountable for crimes against humanity.